If you have started investing in midcap or smallcap funds in the last couple of years, it is likely that your portfolio would be flat or would have given negative returns. Does that mean you should withdraw these investments? We will answer this pertinent question in this article. 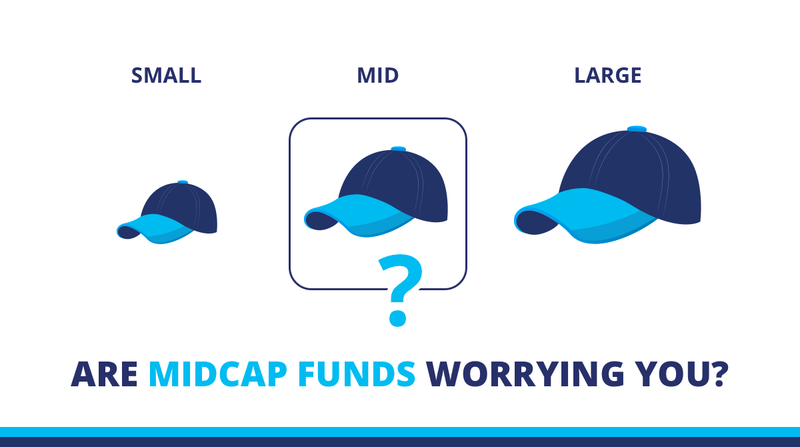 We will focus on mid-cap funds for our analysis since the midcaps have a long history of more than 20 years. Note: The above graph shows the investment growth of INR 100 invested in the midcap category over the last one and a half years. Mid-cap mutual funds are funds that invest 65% or more in medium-sized companies. Among listed companies, top 100 companies are counted as large companies, next 101st to 250th are counted as midsize companies and beyond that are counted as small companies. Typically for investments, medium-sized companies are riskier than large ones and hence mid-cap funds are riskier than large-cap funds. Consequently, mid-cap funds are expected to provide higher returns than large-cap funds. The primary concern of any investor is to not end up losing his/her invested capital. It is often said that you need to stay invested for a longer time in equities to reap the benefits of growth. Let us see what history has to say regarding mid-cap funds. Note: For returns analysis, regular schemes of midcap funds that have large AUM and a long history have been used. We looked at the probability of losing invested capital for different holding periods starting from 1 year and going up to 15 years in mid-cap funds. It is clear from the graph above that the chances of losing invested capital are as high as 25% if you hold your investment only for one year. However, if you hold it for 5 years or more, the chances of losing capital are less than 5%. For more than 8 years of investment period, there is a negligible chance that you may lose your invested capital. Now that we have addressed the fear of capital loss, let’s look at potential returns. The graph below shows maximum returns, minimum returns and average returns of midcap funds for different holding periods. It is evident from the graph, if an investor stays invested in mid-cap funds for a period of only 1 year, an investor runs a risk to make minimum returns as low as -62%, although he/she can make maximum returns as high as 198% (a difference of 260%). However, if the investment period increases to 5 years, the minimum and maximum returns start coming closer to each other (maximum annualized return is 67%, minimum annualized return is -1% and a difference of 68%). In short, as the investment holding period increases, the difference between the maximum and minimum annualized returns narrows down drastically. What it means is that the risk of making losses reduces significantly and the chances of capital growth are higher. An interesting observation in the above graph is that, if you stay invested in midcap funds for 10 years, the minimum annualized returns that you may earn is as high as 12%. With these long term returns, you would be able to generate significant wealth as these comfortably beat inflation and the interest earned from bank fixed deposits. There’s no denying the fact that mid-cap funds can be volatile in the short term. But in the long term, they help in creating wealth. So like we mentioned earlier, these midcap funds are suitable for investors who are comfortable with short term losses and are looking for higher long term returns. Hence the answer to our earlier question “Should I get out of midcap funds if it has given negative returns in one or two years?” is a clear NO. If midcap funds suit your risk profile, you should remain invested in these funds with at least a 5 to 7-year investment horizon. We suggest you to take a risk profile assessment to know your risk profile. You can take it for free on Paytm Money app. At Paytm Money, we have a curated list of small and midcap funds, available under Investment Ideas named “High Risk for High Returns”.